Humor and morals blend to create a show that is fun for all ages, and provides a good lesson too. As with Vischer's other series, Veggie Tales, the lessons center around Christian morals - so it may not be right for your family if you have other religious preferences. Phil Vischer, creator of the Veggie Tales series, is back with a brand new story to hook kids (and parents) with his entertaining blend of humor and morals. The star of his new show, Galaxy Buck, is an ordinary guy named Buck Denver. The series is set in the future, when space travel and communicating with other planets is a day-to-day thing. It’s an exciting time, but Buck feels stuck in his job as a call center employee for a galactic church. Buck wants to do big things for God, but answering phone calls about missing promotional tote bags isn’t quite what he had in mind. So when a call comes in reporting that a receiver is down on a distant planet, Buck is determined to do whatever it takes to get the church’s message to those people – even if it means going up in space himself. 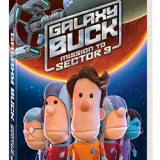 If you’re familiar at all with Veggie Tales, then you’ll expect Galaxy Buck to have the same delightful humor and engaging characters – and you won’t be disappointed. There are plenty of unexpected laughs hidden among Buck’s hard earned lessons, and just like Veggie Tales, the humor is pretty equally appealing to kids and adults. Galaxy Buck is fun to watch, and that’s a huge thing for a children’s show – especially one with a lesson behind it. Buck’s mission is centered around figuring out how to do big thing for God, but he learns that it isn’t necessarily big things that are expected of him. As Buck struggles with this lesson, his motley crew provide plenty of welcome comic relief. 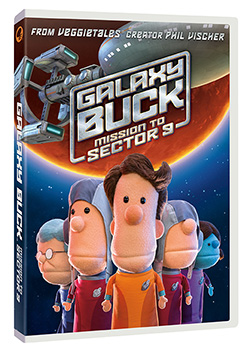 Though the humor and religious lessons are both familiar to Veggie Tales fans, Galaxy Buck has a whole different look. Featuring a blend of CGI, hand carved sets, and cute puppets, it makes for an appealing, child friendly look. All of the characters are voiced by Phil Vischer, but each of their personalities are different enough that you wouldn’t know it’s all the same guy. The entertaining story line, engaging characters, and family friendly humor all make for a show that is loads of fun to watch – and a great lesson, too.